Will there be a Pixar musical? But sites have been buzzing about the possibility of a Pixar musical after an interview Randy Newman gave for Classic FM, in which he mentioned that Lee Unkrich is currently working on a musical. Immediately speculation arose about whether this musical was Unkrich’s untitled Dia de Los Muertos film (the Mexican holiday celebrating the dead, translated to Day of the Dead), which was announced in 2012. There haven’t been a lot of updates on the film since then, but that is to be expected as Pixar operates on a high level of secrecy concerning films in the pipeline. As this film doesn’t have a release date yet, it makes sense that not too much information or artwork has been revealed. Neither Unkrich nor Pixar have confirmed Newman’s comment, but we still have a long time to wait before we know whether his statement is accurate. What’s more telling about this interview is Newman’s assertion that he doesn’t get along with directors and that he may not work with Pixar again, as the byline for the article reads. Randy Newman has scored and performed the music for a number of Pixar films, winning Oscars for “If I Didn’t Have You” from Monsters, Inc. and “We Belong Together” from Toy Story 3, which Unkrich directed. Newman remarked that he wasn’t keen on the temporary score he created for the film, but Unkrich fell in love with it. Whether Lee Unkrich is working on a musical (and whether Randy Newman will no longer create lasting, memorable music for Pixar) remains to be seen. But the idea of a Pixar musical is a tantalizing one. That’s a territory the studio has yet to cover, and would prove the studio’s willingness to experiment with the new. Of course a Pixar musical would also invite the possible unfair comparisons to its parent company Disney. And if Lee Unkrich’s day of the dead film is the musical in question, it would certainly invite comparisons to Reel FX’s The Book of Life. We can be sure nonetheless that the film will be bold and intriguing no matter what direction it’s taken in. Are you for or against Pixar releasing a musical? Is Pixar Planning Another Sequel? After two sequels and a prequel (with Brave squeezed in between) over the past 4 years, many are eagerly awaiting the three original movies in Pixar’s pipeline. After Monsters University, Finding Dory is the only Pixar sequel in the foreseeable future – or is it? During a recent stockholder conference call, Disney CEO Bob Iger may have let it slip that there are more sequels on the way from the studio. Could this just be some poor phrasing in reference to Finding Dory and Monsters University, or is there be a third unannounced sequel in the works? It certainly wouldn’t be surprising; just don’t expect an announcement anytime soon. Which Pixar film would you most like to see a continuation of? The first of what’s sure to be a long legacy of Toy Story Toons has been revealed— Hawaii! Pixar might not be so happy about it, though. "Saw the Pixar "Hawaii" short. Cute." "Ken and Barbie want to go to Hawaii. I don’t know what it’s gonna be attached to. Fun stuff, however." The forums were abuzz about a short entitled Dream Vacation a while back. It’s easy to assume that Hawaii is the aforementioned short and that it will, in fact, be attached to Cars 2. 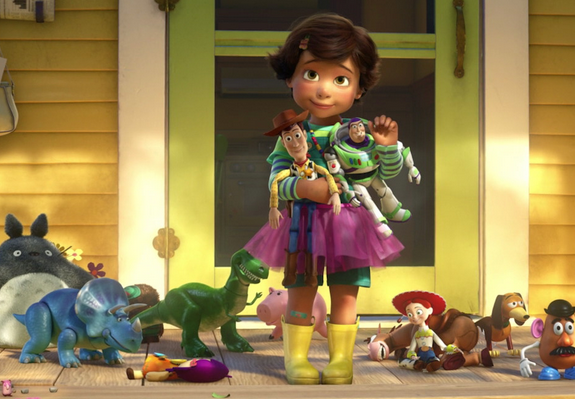 Lee Unkrich confirmed that a Toy Story short would precede Pixar’s high-octane sequel earlier this year. No director (or official details, for that matter) has been revealed since. Dinosaurs, Planes and Rumors! Oh, My! Question: What’s a sure fire way of generating traffic to your movie website? Answer: Write a story about Pixar. I guess we would know. After all, this entire site is devoted to Pixar fandom and the servers haven’t been able to keep up with the amount of visits lately. We thank you for your time/apologize for that. But this phenomenon certainly isn’t exclusive to the internet. Discovery Channel was able to get quite a lot of hype for their TV special, Reign of the Dinosaurs, with misleading reports about Pixar’s (non) involvement — until they had to correct themselves. My point is simple — rumors about Pixar come and go. Sometimes they turn out to be true, and other times they just fizzle away into the internet’s abyss. Like… nevermind. This brings us to the main event. Before you begin to think that I was completely oblivious to the ‘Planes" reports making the rounds lately, I’d like to set things straight. I realize that posting about the subject just fuels the flames of the rumor, but I honestly have no reason to believe that Pixar is making a direct-to-video spin-off of Cars. The original source, Movieline, only claims to have "heard" (from who? Lasseter; the studio; an anonymous Pixarian?) about such a project. As Pixar Talk noted, all of this sounds like a bad April Fool’s joke. It’s almost like one of our annual Upcoming Pixar pranks has begun to run wild. Update: Just as I privately suspected, the Animation Guild blog reports that Planes is being produced at DisneyToon Studios — not Pixar. Think Buzz Lightyear of Star Command; no story details have been revealed. It’s typical to find concept art all over a Pixarian’s wall, but it isn’t everyday when an unannounced character shows up hidden in a Pixar featurette. That’s why the still above is so interesting. That’s Greg Dykstra, a character sculptor at Pixar showing his model for a young version of Carl during an Up featurette. Behind him (circled, click to view larger) you’ll notice a boy and a dinosaur. Does anyone know what this could be? Bryko614, who noticed the concept art above while watching the Up B-Roll, took that question to Ronnie del Carmen. Via del Carmen’s Twitter: "@Bryko614 I do. But not telling. Nothing to do with anything Toy Story, tell you that." Understandable. Hmm… Could it be concept for a feature? Definitely not Cars 2; sounds kind of farfetched for The Bear and the Bow or Newt. With this, I’ve come to a conclusion that it’s probably art for an upcoming short film. We’ll let you know if anything develops further like plot details or other announcements as they come. Your thoughts…? /Film reader DC sent into the site some more information on BURN•E. In the feature film there is a sequence where Eve and WALL-E fly around the Axiom Starliner, and enter through a door locking a poor welder bot on the outside of the ship. The bot bangs his fists against the door after he realizes that he has been locked out. says the article. /Film adds that bot is complete with a logo akin to our mockup (pictured). Read the article to see what /Film’s Peter Sciretta thinks the short will be about. UPDATE: An anonymous comments points out that BURN•E can be seen in the "A Space Journey In Sound" featurette quite clearly at about :58 seconds.